One of the biggest campaign promises the “More with Four” Democrats ran on was funding education in Wake County. Apparently they meant funding education ‘over time’. Long-winded is being kind. It’s long-winded so that his supporters won’t figure out he’s breaking the campaign promises he made on education spending in favor of his beloved transit boondoggle. I’ve included the full text at the bottom of this article. In it, Mr. Burns enlightens us on all he’s learned about education spending, which is that we need more. Burns also makes sure to include his opinion that it’s all the past board Republican’s fault and that of Republicans in the legislature. Mr. Burns can’t help but demagogue; repeating all the Moral Monday and NCAE protest taglines he can. But don’t worry, he represents all of us now…or something. There’s a lot in this post. More than needs to be, really. Most of it based on the faulty premise that spending more on education is going to solve any problems — for example, he talks about raising per pupil spending. Someone, please buy Mr. Burns the book, The K-12 Implosion. Mr. Burns also doesn’t include the $230 per pupil boost those horrid Republicans gave students last year. Or the increases in 2011-2012 and 2012-2013. Mr. Burns mentions all those teachers quitting because of pay, despite that narrative being debunked and that resignations dropped off this year. In Wake county, teacher resignations this school year dropped by 14%. I found this line to be interesting: “this County has underfunded public education for several years running, predating the Great Recession.” Underfunded in comparison to what? Edit: just a note to those who might understandably be unwilling to read this whole giant post. I wrote this to let you know the concerns and issues that face all of us on the Commission, and to give one reasonable approach to reconciling them. There are others, which is why I look forward to this week and working with my colleagues to work this out. I’m not digging in. I’m letting you know what I’m thinking. My first budget process has been an interesting one. I wanted to fill you in on some of the considerations facing us. There are so many numbers involved that it’s a little hard to discuss this issue without descending into decimals and commas and completely losing the bigger point. But here I go. This is a long one. Bear with me. First, let me say this: none of the below discussion would even be necessary had our State leadership done its job. The attacks on public education, whether it be through unregulated charter schools, budget cuts, attacks on teacher pay and tenure, cutting teacher assistants and generally undermining the entire institution of North Carolina’s Public Schools, are unconscionable and deeply damaging. In this, the 150th year of public schools in North Carolina, the General Assembly has completely failed in its duty to ensure a quality free education for every child. So, counties are left to pick up the slack. Let’s just get that straight right off the bat. So here’s the rub: this County has underfunded public education for several years running, predating the Great Recession. Combine that with the General Assembly’s attacks, and the quality of our public schools has begun to falter. Teachers are expressing their displeasure with the circumstances by leaving, and our County’s economic development trump card – great public schools – is beginning to fray. Perhaps you’ve heard that from me before. So I want to increase school funding. But here’s the issue. Last year, a Capital Improvement Plan was passed in order to spend and pay back over $800MM in construction bonds authorized by the voters in 2013. It raised property taxes by 4.4 cents per $100. It’s the only increase my predecessors voted for, and it does nothing for operating costs. But it’s a real one with real impacts on taxpayers. The Superintendent of Public Schools, Jim Merrill, produced a proposed budget that seeks an increase to school funding of $48.9 Million, for a total county schools contribution of $389.8 Million out of a total county budget of $1.1 Billion. County Manager Jim Hartmann produced a reasonable, responsible and very progressive budget that allocated an additional $34.4 Million, for a total of $375.9 Million, to public schools. His budget would require a 2.9 cent tax increase per $100 of valuation (a .029 increase to the tax rate). It would be a 10% increase to education funding and the single largest increase since the late 1990s. Had I run on that budget in 2014, it would have been seen as a progressive dream budget. Keep in mind, and you can click on the ad to my left, I called for the then-majority on the County Commission to enact a $60 tax increase to increase school employee pay – the cost of 4 delivered pizzas. Jim Hartmann’s proposed budget would be a $72 tax increase. That needs to be kept in mind. If I supported only the funding in the Manager’s budget, I would be fulfilling my campaign pledge. Many in the community have called on us to fully fund the Superintendent’s budget, which would require more than a penny of additional tax, totaling approximately $110 in property tax increase, and directing all of it towards only one responsibility of County Government. In fairness to their argument, even if we passed another penny, which would raise the increase to approximately $104 and bring in approximately $12.4 Million more, our tax rate would still be the lowest in our region and the lowest of any large county in North Carolina (to say nothing of how it compares to property tax rates in the Northeast). In a perfect world, where there were no retired people living in houses that have appreciated remarkably while their income has dropped, I might even ask for more than that. Were there no people struggling to make a living such that $104 is a significant unplanned expense, I would be happy to ask people like me to pay even more for schools that help get everyone else to the economic status I have been lucky enough to attain. Wake County’s per pupil expenditure in 2008-2009 was $2,296. In 2014-2015 it was $2,186. That decrease is a consequence of tremendous growth (2,000 – 4,000 students a year) and flat funding. It is not acceptable. Mr. Hartmann’s budget increases our per pupil expenditure to $2,374. I would like to increase our per pupil expenditure to a level higher than it was pre-Recession, accounting for inflation, and enable the School Board to increase supplemental income for teachers and school employees. I have been especially touched by the stories told by bus drivers and occupational therapists as well as our dedicated and miracle-working teachers. That number for me is somewhere around $2,400, which would require an additional $6 million over and above the Manager’s budget. I think that would be a responsible place to start filling the hole created by the last several years. The threats looming in the next two years are many. 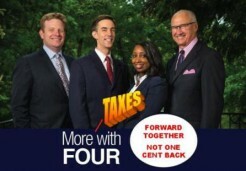 An irresponsible and illogical portion of the leadership in the General Assembly has repeatedly threatened to take up to $40 Million of sales tax revenue a year away from Wake County and distribute it to other counties – which would leave us with no choice but to raise property taxes to replace that revenue. They have also threatened to cap our teacher supplement in such a way that a dollar of state funding would be pulled back for every dollar over the cap we fund. Moreover, the fire tax has not been increased in many years, placing our overburdened rural and community fire departments in a budgetary bind. Finally, and crucially, we MUST pass a transit referendum in 2016, in which I will be asking you to vote to tax yourselves in order to fund a crucial step in our development as a community. To do that, I need to have some credibility as someone who minds the budget. So I have not supported the Superintendent’s full budget request. Nor have I supported the concept of an additional penny in taxes (which wouldn’t get all the way to the Superintendent’s request). Until now, I haven’t stated that publicly, but I have been in constant and professional discussion with my colleagues and the School Board throughout the last several months. The relationship between the boards has never been stronger or more professional in my memory. It has actually been a very insightful and helpful process. I’ve also been listening to the community and taxpayers about what is the right way to approach this issue. Education has been underfunded, and we must work to overcome the hole my predecessors and their ideological soulmates in the General Assembly placed us in. But I don’t think it would be responsible to try to do it all in one year and then pretend we can ignore the additional $100MM in unmet requests on page 14 of the School’s proposed budget over the next several years. Any approved budget must come with an understanding with the School Board that we will sit down and develop a multi-year budget plan that gives predictability and stability both to the schools and the County taxpayer. I also want to make sure we preserve budgetary flexibility to meet all of the needs the County must meet. I receive calls every week from people frustrated that County Human Services is unable to process Medicaid and Food Stamp applications and payments in a timely fashion. I am concerned that a large portion of the Sheriff’s budget is taken up with mental health concerns of inmates who are going untreated until they commit a crime. I look at our open space fund and realize that bond is nearly completely spent, with much more to purchase and preserve and a Greenway transportation network to complete. In short, this is a complicated beast I am riding. (1) Increase per pupil expenditures. (2) Increase our competitiveness with other large urban areas with whom we compete economically. (3) Be able to look at a person who receives the bill and explain what they bought in a way that makes sense. (4) Retain our experienced teachers and school staff. (5) Show a renewed dedication to public education in Wake County and a return to having the best public schools in the country. (6) Responsibly manage tax dollars entrusted to me through a commitment to a multiyear planning process that delivers stability and predictability to the schools and the taxpayer. My three children are all enrolled in the public schools. Nobody on either board can say that they have more invested in the schools than I do. Their well-being and future, and that of their classmates, will be foremost in my mind no matter what I do. This entry was posted in EDUCATION, LL1885, Moral Monday, POLITICS NC, Random Musings, Taxes and tagged Budget, John Burns, Wake County Board of Commissioners, WBOC. Bookmark the permalink. John Burns – Wake County Commissioner represents some of the worst in what politics has to offer.